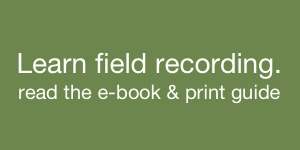 Have you collected thousands of field recordings? Perhaps you’re using a sound clip library at work. Maybe it’s an expanding collection of published libraries and indie recordist tracks. That’s hard to manage when you’re scrambling to get your work out before the next milestone deadline. Maybe you just want to step back into the wilderness and record new tracks. How do you stop wrestling with your jumbled sound collection and get back to work? Sound fx metadata tames these sound libraries. We looked at the basics of sound clip metadata, and plunged into the details beneath the surface. Earlier this week, we saw which metadata fields suit basic, advanced, and pro sound libraries. 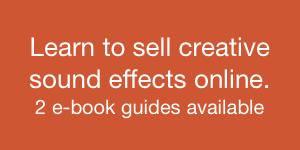 That’s great, but how do you add this metadata to sound effects, and organize your sound library? Explore what metadata apps do. Next week we’ll get into specifics. I’ll look at popular apps, explain their highlights, and share a chart comparing their features. It’s interesting to see how this happens. At first, CD libraries didn’t have this problem. Their plastic cases are vestigial now, but at the time, they actually made it easy to store and sort sound libraries. As sound collections digitized, they lost shape, and began to sprawl. I saw this during my time as a sound librarian. At times I’ve had to hunt and peck through SQL server databases to tweak sound clip listings. I’ve used unholy combinations of Excel spreadsheets, FileMaker databases, custom scripts, and hacks to grapple with hundreds of thousands of clips. Thankfully, that’s no longer the case. It didn’t take long for specialized software to be written to help sort and use large sound libraries. Understandably, that’s a large task. So, before we get to the details about each app, let’s learn about what this specialized software does, and how it works. A handful of independent publishers have written specialized software to wrangle exploding collections of sound files. This software allows you to search, browse, and audition clips in your library. It also embeds text data into the file. This data becomes attached to it, and is carried with it wherever the file travels. It doesn’t interfere or damage the audio at all. 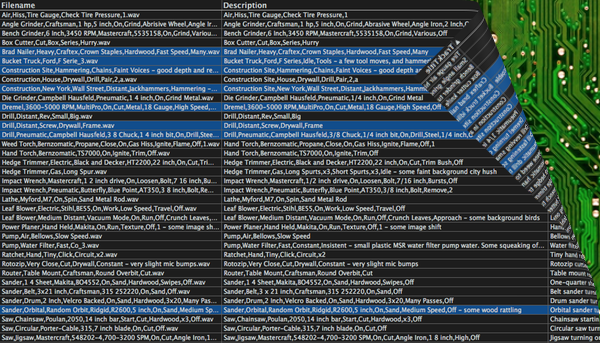 Dropping this file into the app magically displays a wealth of text: categories, tags, descriptions, and even images. The term for this software varies. It’s sometimes called by the stiff corporate name asset management, or the more friendly sound effects database. Instead, I prefer the term sound browsing app or metadata app. That’s clear, and simple. And, while not ever app adds metadata or browses sounds, I’ll use those terms interchangeably to refer to software that manages sound libraries. What do Metadata Apps Do? The biggest issue with huge sound collections is actually being able to access the full scope of sounds in a library. Sound browsing apps solve this problem. They’re designed to add thousands of sound clips to a master list (sometimes via drag-and-drop), and sort them. 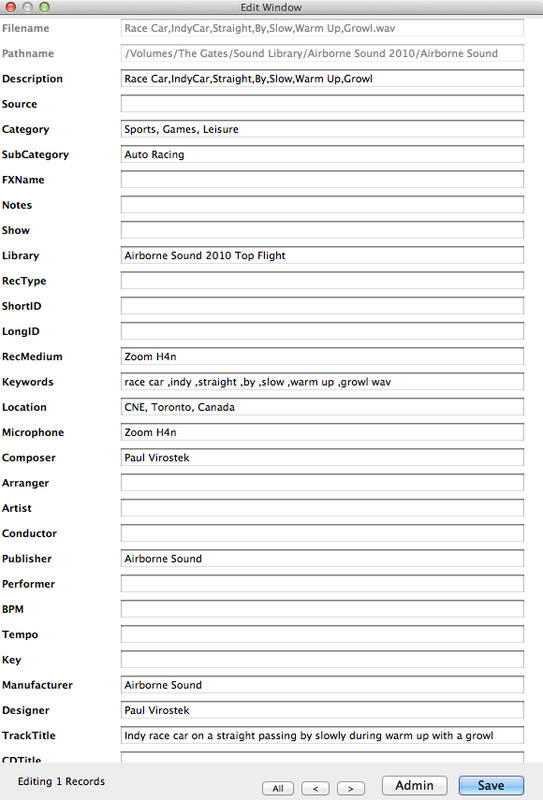 They then search for, browse, find, and select sound fx from this list. Many sound pros want fine control over their collections. Sound browsing apps provide ways of organizing libraries in various types of lists: separate databases of different libraries, adding clips to playlists that can be shared with other sound pros (sometimes called spotting), and keeping a running record of what’s already been played or transferred. Another part of this control is provided by advanced search. That allows editors to display precise search results. That helps them to find the right sound and return to work quickly. 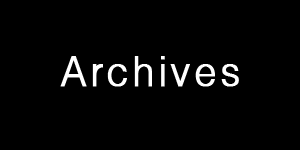 Accommodate rare file formats (FLAC, OGG, others). Of course, once a sound pro has found some sound clips, they need to hear them. So, sound browsing apps allow audio playback. Most allow non-linear random-access playback and scrubbing. Some display waveforms and markers. Others allow users to play and select only a portion of any track. Playback and display multi-channel sound files. Playback sound through enhanced audio configurations, such as ReWire. Some sound files arrive with metadata already embedded within them. 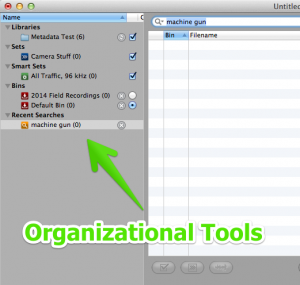 The best apps read a variety of these metadata types. Most will read “open” formats such as MP3’s ID3, or the broadcast wave BWAV format. Premium apps use a private style of metadata that only their software can access. Usually this metadata offers more fields and features than ID3 and BWAV. However, it’s almost always protected. That means that other apps can’t see this private metadata. Scanning, reading, and displaying metadata from previous files is only part of the issue, though. Will the app write or embed new metadata after editors make changes? Some apps only read the metadata, but cannot write changes back to a file. Instead, changes to the “Description” or “Category” are saved to a database, not in actual metadata. The difference? 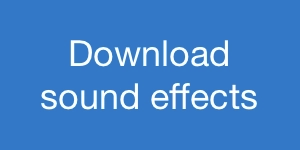 Those changes are stored in an external database file apart from the sounds, instead of being permanently embedded within the sound effect itself. That means changes won’t “travel” with the sound clip, but only remain on the computer being used at the time. The result is that any of these sounds you send to a friend won’t show new metadata when he opens them on his computer. However, a portion of the apps can write to the common ID3 and BWAV formats. For example, some apps can read foreign Soundminer metadata, but can’t write back to it, only to ID3 and BWAV. That covers reading and writing metadata. But what about composing new metadata? Right now, most metadata apps are weighed heavily towards reading metadata, but not composing it. 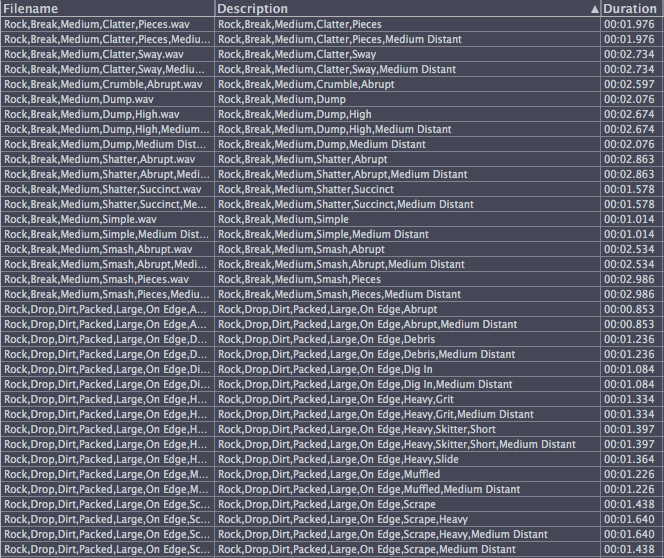 It’s interesting that, as of early 2014, no metadata app offers an easy, fluid way of adding large amounts of metadata. Some offer features to compose and apply batches of metadata all at once. For example, an app may apply a library name to 10,000 clips in seconds. While that’s helpful, it doesn’t solve the problem. Why? Well, it’s true that assigning the category “Vehicle” to a thousand truck sound fx is far better than doing this one clip at a time. However, batch functions aren’t enough. Why? It has to do with the way pros search sounds, and choose results. After all, search results aren’t helpful if they all look the same. If 10,000 clips look identical, how do we choose between them? Technically speaking, that offers no advantage to the sounds not being named at all! Of course, in many cases you’ll need to name 10,000 sounds identically, such as when assigning a library name across an entire collection. In this case, batch renaming is useful. But what about naming thousands of slightly different sounds? For example, I recorded over 1,200 rock sounds for Pompeii. Batch renaming them all “rock drop” wouldn’t work. That would be inaccurate and unhelpful. Such a generic, batch-assigned name would not help editors choose the perfect rock crash for a film scene. Instead, each sound had to be auditioned and given a unique suite of metadata. This is an arduous, click-centric process in even the best metadata apps. What would be better? A good metadata composition solution would allow the ability to add variable metadata quickly. A keyboard-centric method with typed shortcuts using smart-tabbing and auto-complete would be a great start. A dedicated, full-screen sound librarian page with custom fields would be ideal. At the present, though, there are no apps that do this well. 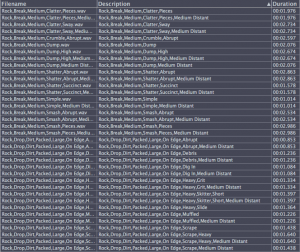 Some come close, but adding large amounts of varying metadata across thousands of entries remains cumbersome. At first glance, it may seem like a glaring omission to overlook a method of composing metadata easily. 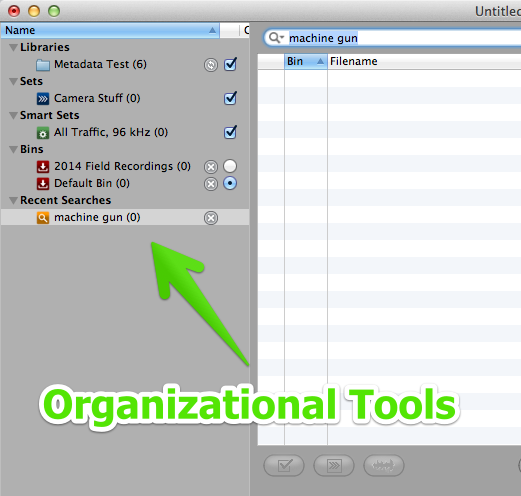 After all, the main reason these apps exist is to search and sort metadata. Sound pros make crucial decisions based on the metadata they see. But metadata has to come from somewhere, right? If there isn’t a way to add large amounts of variable metadata quickly, pros won’t be able to find or use their collections, and the software becomes considerably less useful. In reality, though, a lack of metadata composition tools is understandable. These apps are tailored towards the people who need to find and use sound clips daily: sound editors. Perhaps in the future, metadata apps will add features that help their pro cousins: sound librarians. Be aware, however, that adding extensive fresh, diverse metadata remains an issue with current sound browsing apps. Not just read metadata, but write to it as well. Number of metadata fields available. Of course, once pros have found sounds, browsed metadata, and selected the proper clip, they’ll need to do something with it. Drag-and-drop. Select the clip from the sound browser, and manually drag it, and drop it onto a sound editing app window. Bin transfer. Transfer the sound directly into an audio editing app’s sound list, or “bin”. Finally, the very best metadata apps allow you to transfer only a portion of the original file. Imagine a five minute clip with hundreds of door closing sounds. You need just one two-second door close clip. There’s no sense in transferring the entire five minutes of the file. So, the metadata app allows you to select those two seconds via a waveform display beneath your search results, and transfer only that abbreviated duration to a sound editing app. Apply Audio Unit (AU) or Virtual Studio Technology (VST) plug-ins to transferring clips. Transfer not just a single sound, but batches of sounds, or lists of sound files collected in a playlist. Transfer by adding a few seconds of “padding” to either side of the selection (also known as handles). As you can see, metadata apps do a lot of heavy lifting. They have huge tasks to complete to ensure sound pros and librarians can manage large sound effects collections. So, which apps get the job done well? How can you choose between them? In the next article in the series, I’ll describe the most popular sound browsing and metadata apps to help you decide what’s best for you.